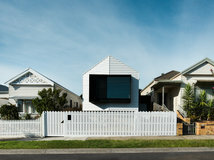 A complicated situation involving jilted architects saw STAR Architecture step in to take over this entire project. 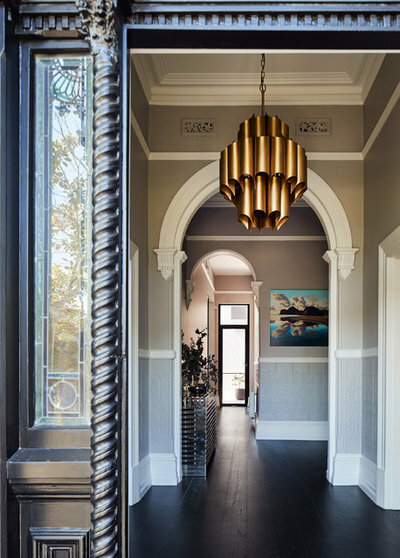 Their brief was to honour the home’s history, fix its problems, and ultimately open up this beautiful Italianate-style Melbourne mansion so its family could fully enjoy its incredible potential. Sometimes, from despair, good things come. The family who owns this house had lived here for seven years before they were ready to renovate. But by the time they met Aleksandra Rakocevic, principal at STAR Architecture, they were in a bad place. They were exhausted after a lengthy planning process and still felt the (admittedly complex) plans weren’t right. The project was running over-budget and they were ready to sell up and start again. The 1886 double-brick Boom Time mansion was subject to heritage protection but was in very good shape structurally, with solid bluestone foundations. 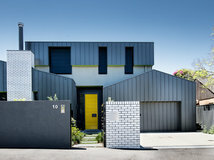 It had its original front but was lumbered with an ugly 1990s extension with low ceilings at the rear. 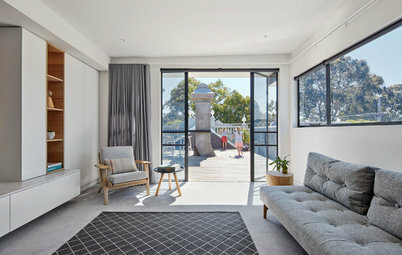 The aim of the 20-month renovation was to honour the historical significance of the frontage while replacing the extension with a structure that spans three levels and is a display of modern resplendence, with open spaces, simple geometric shapes, and an abundance of light. 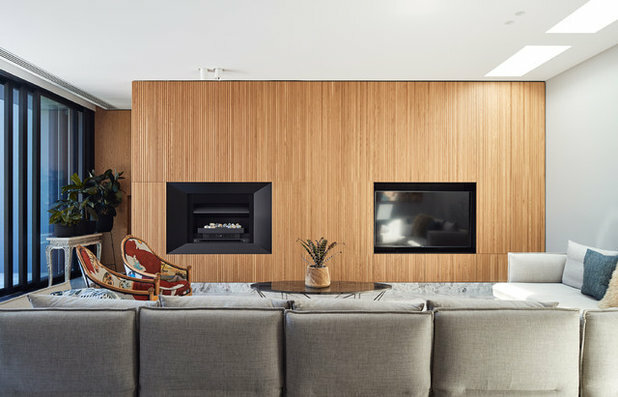 In particular, the clients wanted a flawless interior transition from the restored house to the extension, which would house a pool, gym, and outdoor pavilion, all on top of a basement. They also required a series of flexible spaces that opened to landscaped areas. 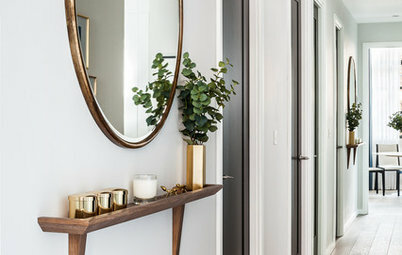 While Rakocevic connected with the couple and shared their vision for the property, their relationship had a Eureka moment when she began to show them 3D models rather than 2D plans. 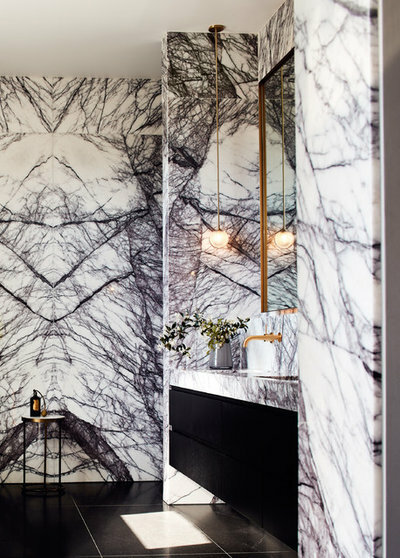 “As soon as we took a 3D model and walked the clients through the space, that triggered the progress,” she says. 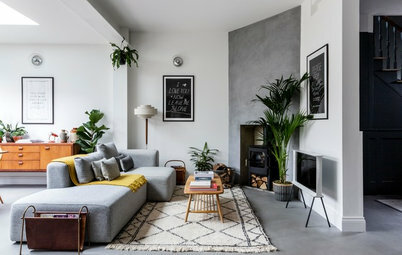 It fast-tracked their vision and eventually led to her young firm taking over the interior design for the project in addition to the architecture. The build was big in scope yet highly detailed in practice. A case in point was the hallway panels; some needed replacing but were impossible to find so the builder took an original mould from cardboard then made a silicone mould from a panel to enable him to produce more. The ground floor opens onto his and hers studies on either side of the entrance. 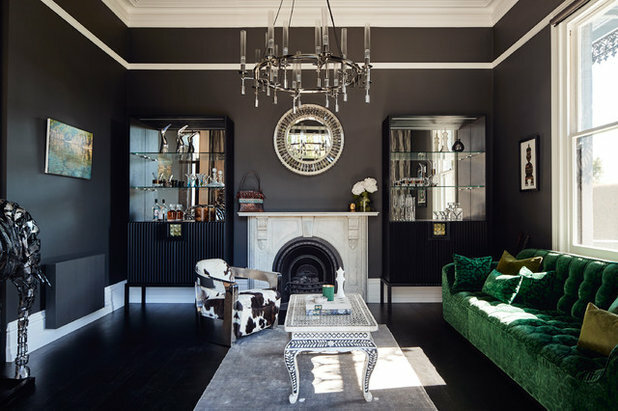 The husband is a fashion entrepreneur and his study features a dark, traditionally masculine interior, with David Bromley artwork and a cluster of Vølt lights from Søktas. Closer inspection of the joinery shows its use of antique glass to add lustre. Marble handles play against the American oak. 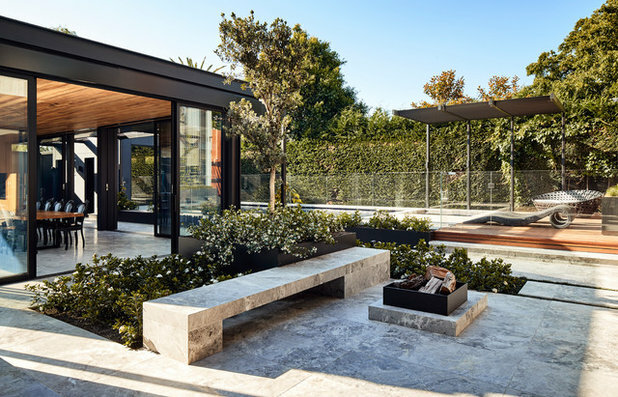 An opulent cocktail lounge sits behind the study and opens onto an outdoor courtyard that is flanked on one side by an expansive kitchen and living area with direct access to a garage, and on the other by an outdoor pavilion. 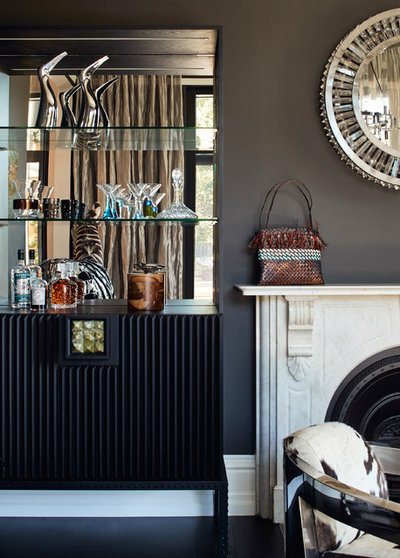 Darkness versus light, juxtaposing materials and pattern plays feature in this room and continue throughout the home. “The architectural opposites in this program complement via contrast, showcasing their differences: old and new, stone and glass, classic and contemporary,” says Rakocevic. 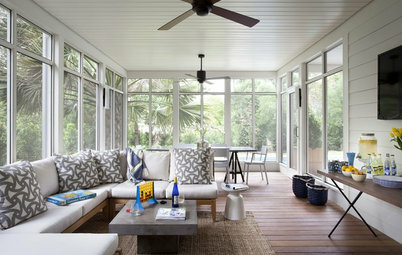 A verandah wraps around this side of the house, running from the study at the front of the home around to the cocktail lounge. The end of the hallway opens out onto a vast kitchen/dining/living area. 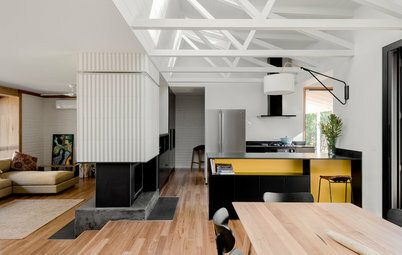 The family entertains a lot and requested a functional kitchen, with all its functions hidden. It didn’t have to appear spotless – they know life isn’t always clean and smart – but it needed to be easy to hide food preparation or post-meal mess. 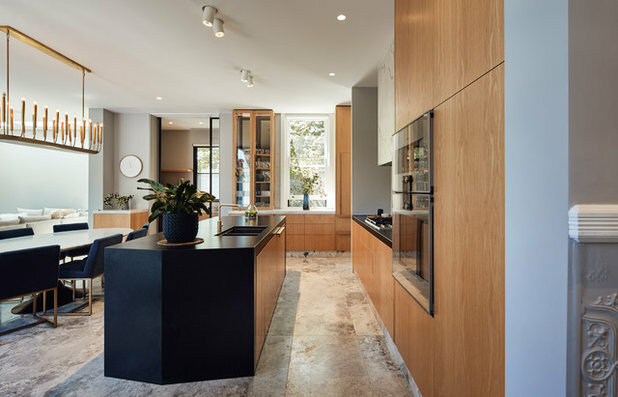 The black granite island benchtop is bold and beautiful among the light and functional American oak joinery. The kitchen leads onto the dining and living area, all celestially lit up by Silver Galaxy stone tiles. 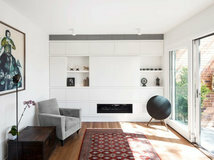 In the living area American oak joinery houses a gas fireplace and television. Left of the living area (and passing across the rear of the cocktail lounge) is a courtyard area that draws people to it in winter with a firepit. Plantings include a gardenia and pohutukawa tree. On the far side of this, next to the pool, is an open-air cabana with an outdoor shower. The courtyard provides the transition to the outdoor dining pavilion with a 12-seat table and kitchen. 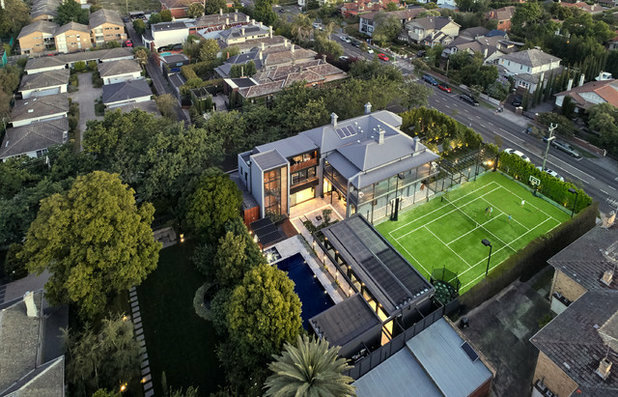 This, in turn, sits between – and provides extensive outdoor views to – the pool on one side and the tennis court on the other. 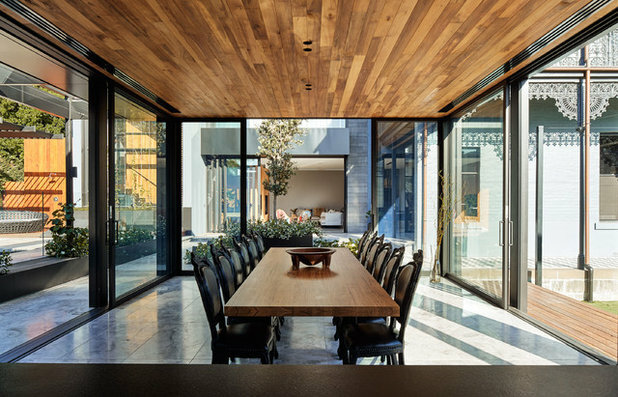 The rimu timber-lined ceiling provides a sense of enclosure, while floor-to-ceiling doors can draw back to open up the entire area. The 4.7 x 10-metre pool coping is also in Silver Galaxy stone. 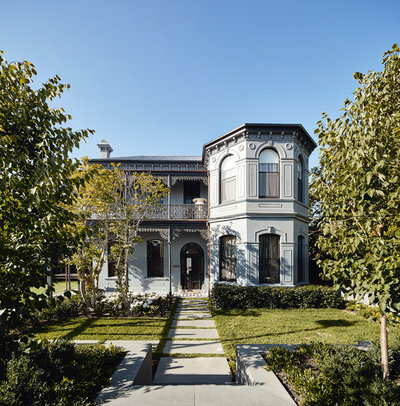 Black frames and fascias reflect the black ironwork in the original, heritage, part of the home. The far end of the pool houses a gym. 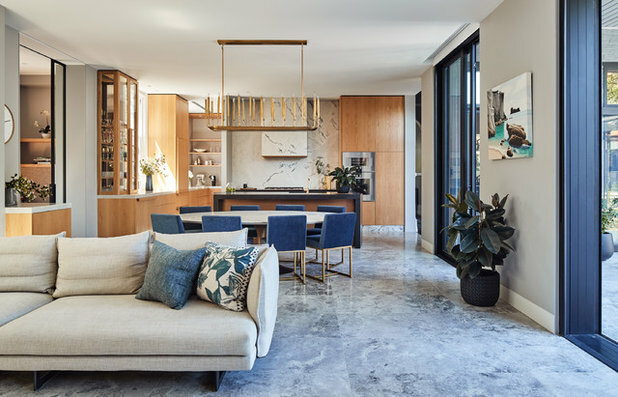 From here it’s possible to appreciate how the contemporary structure and materials, including spotted-gum stair screens and ironbark shower walls, complement the original historical elements of the home. 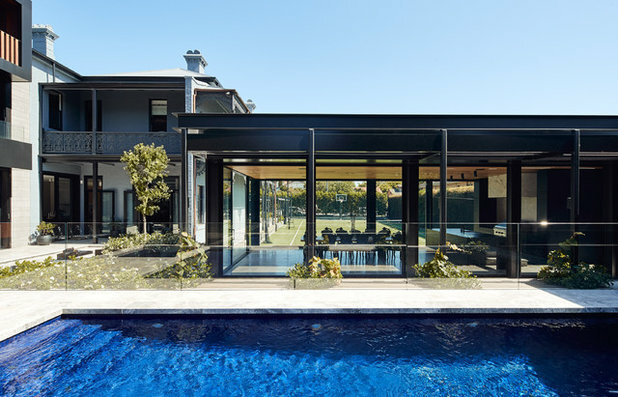 While the previous architect had designed the extension in brick and render, Rakocevic re-introduced bluestone elements to the exterior to reflect the materials used in the original home. 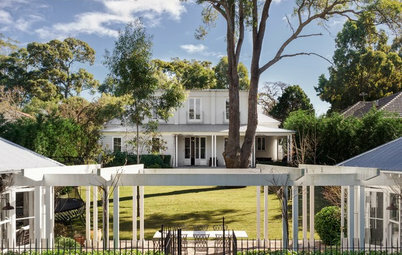 Adjacent to the tennis court, and conforming to the height of the original verandah, white wisteria grows over trellising. This will provide shade and softening elements as the landscape matures. The vertical column at the rear of the home contains the stairs that connect the lower-ground floor (entertainment area), ground floor (living zone), and first floor (bedroom level). 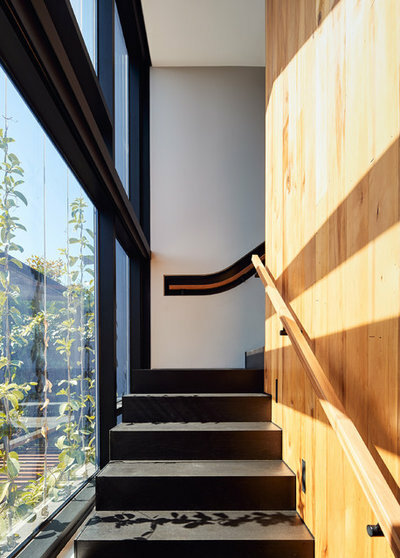 The rimu-clad wall to the right encases the lift shaft that runs between all levels of the home and right up to the rooftop sky lounge, which has views of the city. 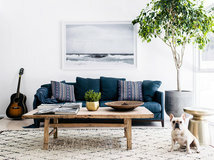 The lower-ground level’s introduction involved a five-metre excavation that was particularly challenging, “but you go down there and it feels like a living room,” says Rakocevic. It features a car turntable for the car-collecting husband, a bike-parking station for all the family, and a workshop. 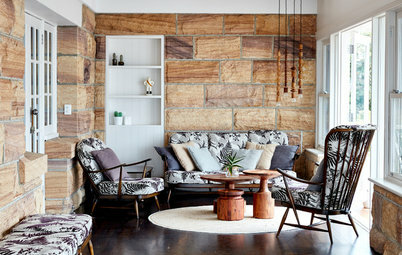 At the other end is an assortment of entertainment areas including a bar, wine cellar and home theatre. 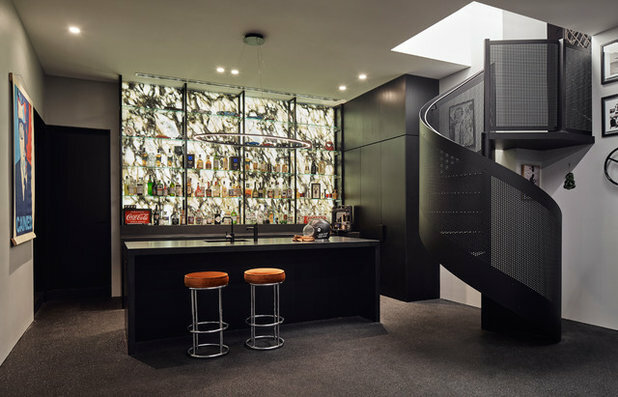 In keeping with the aesthetics elsewhere in the home, the bar is backlit onyx stone; its black veins complemented in the powder-coated aluminium staircase from Enzie. 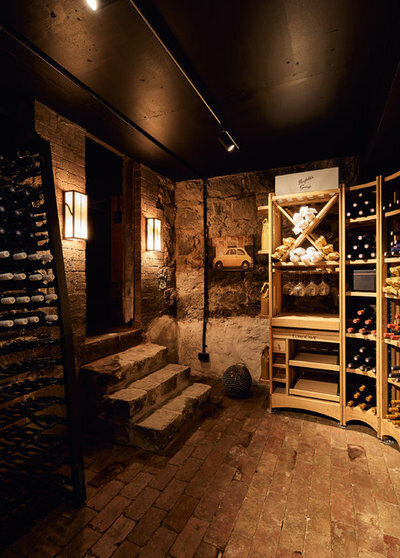 Downstairs are two wine cellars; a connected storeroom keeps wines that are not for display. The wine racks are from EuroCave Australia. 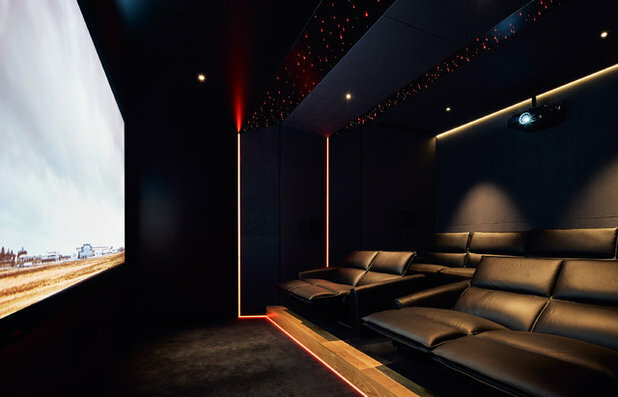 The home theatre seats 12 and caters to all the family. 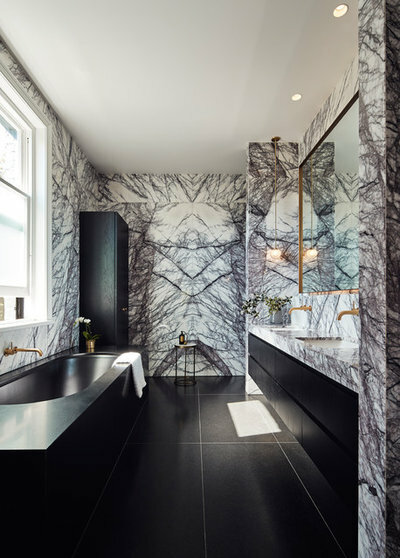 Upstairs, on the bedroom level, the master suite features a walk-in wardrobe and master ensuite clad in New York marble with a granite floor and bath surrounds. 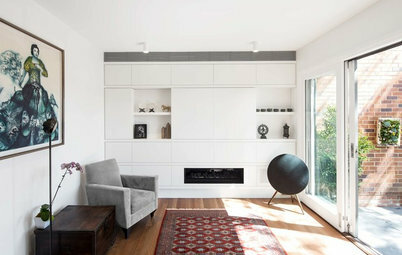 The joinery features a black Japan finish on American oak timber veneer to keep the monochrome scheme. And that was exactly what they got. The best. What do you love most about this luxury home? Share your thoughts in the Comments, save your favourite images, like this story and join the conversation. Personally I think they missed the boat. 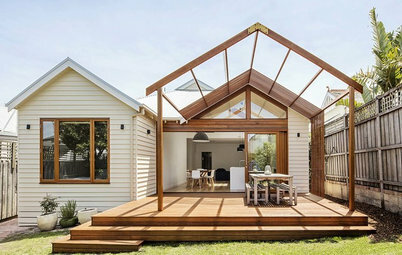 I too feel that the modern extension and original are too far removed from each other in look and feel to call it a seamless transition. It looks very much like you are walking out of the old and into the very new stark modern new. Not saying I am disliking it all but I do think there is a far more definite line between old and new as opposed to seamless. I am sure the owners would be thrilled with the result none the less.